Mick Tuite is the Professor of Molecular Biology at the University of Kent, an institution he joined in 1983 following postdoctoral research in Oxford (UK) and the University of California, Irvine (USA). Mick began his research on the yeast Saccharomyces cerevisiae in 1975 as a DPhil student under the supervision of Brian Cox in Oxford. Here he studied the non-Mendelian element [PSI+] that subsequently turned out to be a prion and sparking a long-term and continuing research interest in post-transcriptional events using yeast as a model organism. Amongst the contributions he has made in this area he is perhaps best known for his work on the [PSI+] prion to determine fundamental aspects of how prions are propagated, and secondly on how a major clade of fungal pathogens (that includes the human pathogen Candida albicans) uses a non-standard genetic code. More recently his research interests have involved exploring various facets of protein folding in the endoplasmic reticulum. Mick’s research group is part of the Kent Fungal Group (www.kentfungalgroup.com) which represents one of the largest collections of fungal researchers in the UK. Mick and his colleagues in the KFG makes use of a variety of yeast systems to approach questions that underpin fundamentals of cell biology and human disease. The research in his group has been extensively funded by grants from the BBSRC, Wellcome Trust and the Leverhulme Trust. 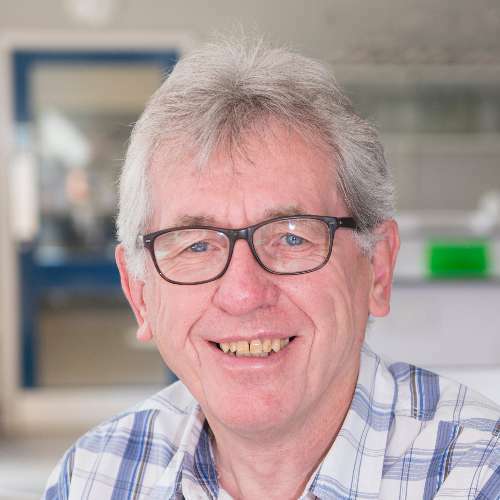 Mick is currently Director of Education in the School of Biosciences and Chair of the Scientific Conferences Committee of the Microbiology Society. He is also actively involved in Authentic Biology (www.authentic-biology.org) a major outreach project that was launched by funding from the Wellcome Trust. He was made a Fellow of the American Academy of Microbiology in 2018. The focus of his research is protein folding in the eukaryotic cell; how it is achieved with such accuracy i.e. “authentic folding”, but also exploring the consequences to a cell when a protein misfolds i.e. “aberrant folding”. Authentic folding: here his interests lie in the protein folding machinery in the endoplasmic reticulum and specifically the role of the enzyme protein disulphide isomerase (PDI). PDI is responsible for the correct insertion of disulphide bonds that hold together the 3D conformation of many proteins that are naturally secreted from the cell. The approaches being taken in this project span biochemistry, genetics and cell biology. Aberrant folding: the focus here is on the formation of amyloid structures in proteins as a means to better understanding of major neurodegenerative diseases such as Alzheimer’s disease. He also studies a form of ‘infectious amyloid’ called a prion in yeast where they can be beneficial to the cell. This has led to an interest in molecular chaperones and how they deal with misfolded proteins and also allow cells to propagate the prion form of a protein. Showing 50 of 150 total publications in the Kent Academic Repository. View all publications. Nan, H. et al. (2019). A viral expression factor behaves as a prion. Nature Communications [Online] 10:359. Available at: https://doi.org/10.1038/s41467-018-08180-z. Prions are proteins that can fold into multiple conformations some of which are self-propagating. Such prion-forming proteins have been found in animal, plant, fungal and bacterial species, but have not yet been identified in viruses. Here we report that LEF-10, a baculovirus-encoded protein, behaves as a prion. Full-length LEF-10 or its candidate prion-forming domain (cPrD) can functionally replace the PrD of Sup35, a widely studied prion-forming protein from yeast, displaying a [PSI+]-like phenotype. Furthermore, we observe that high multiplicity of infection can induce the conversion of LEF-10 into an aggregated state in virus-infected cells, resulting in the inhibition of viral late gene expression. Our findings extend the knowledge of current prion proteins from cellular organisms to non-cellular life forms and provide evidence to support the hypothesis that prion-forming proteins are a widespread phenomenon in nature. Marchante, R. et al. (2017). The physical dimensions of amyloid aggregates control their infective potential as prion particles. eLife [Online] 6:e27109. Available at: https://doi.org/10.7554/eLife.27109.001. Sideri, T. et al. (2017). The copper transport-associated protein Ctr4 can form prion-like epigenetic determinants in Schizosaccharomyces pombe. Microbial Cell [Online] 4:16-28. Available at: http://dx.doi.org/10.15698/mic2017.01.552. Prions are protein-based infectious entities associated with fatal brain diseases in animals, but also modify a range of host-cell phenotypes in the budding yeast, Saccharomyces cerevisiae. Many questions remain about the evolution and biology of prions. Although several functionally distinct prion-forming proteins exist in S. cerevisiae, [HET-s] of Podospora anserina is the only other known fungal prion. Here we investigated prion-like, protein-based epigenetic transmission in the fission yeast Schizosaccharomyces pombe. We show that S. pombe cells can support the formation and maintenance of the prion form of the S. cerevisiae Sup35 translation factor [PSI+], and that the formation and propagation of these Sup35 aggregates is inhibited by guanidine hydrochloride, indicating commonalities in prion propagation machineries in these evolutionary diverged yeasts. A proteome-wide screen identified the Ctr4 copper transporter subunit as a putative prion with a predicted prion-like domain. Overexpression of the ctr4 gene resulted in large Ctr4 protein aggregates that were both detergent and proteinase-K resistant. Cells carrying such [CTR+] aggregates showed increased sensitivity to oxidative stress, and this phenotype could be transmitted to aggregate-free [ctr–] cells by transformation with [CTR+] cell extracts. Moreover, this [CTR+] phenotype was inherited in a non-Mendelian manner following mating with naïve [ctr–] cells, but intriguingly the [CTR+] phenotype was not eliminated by guanidine-hydrochloride treatment. Thus, Ctr4 exhibits multiple features diagnostic of other fungal prions and is the first example of a prion in fission yeast. These findings suggest that transmissible protein-based determinants of traits may be more widespread among fungi. Speldewinde, S. et al. (2017). Disrupting the cortical actin cytoskeleton points to two distinct mechanisms of yeast [PSI+] prion formation. PLOS Genetics [Online] 13:e1006708. Available at: https://doi.org/10.1371/journal.pgen.1006708. Mammalian and fungal prions arise de novo; however, the mechanism is poorly understood in molecular terms. One strong possibility is that oxidative damage to the non-prion form of a protein may be an important trigger influencing the formation of its heritable prion conformation. We have examined the oxidative stress-induced formation of the yeast [PSI+] prion, which is the altered conformation of the Sup35 translation termination factor. We used tandem affinity purification (TAP) and mass spectrometry to identify the proteins which associate with Sup35 in a tsa1 tsa2 antioxidant mutant to address the mechanism by which Sup35 forms the [PSI+] prion during oxidative stress conditions. This analysis identified several components of the cortical actin cytoskeleton including the Abp1 actin nucleation promoting factor, and we show that deletion of the ABP1 gene abrogates oxidant-induced [PSI+] prion formation. The frequency of spontaneous [PSI+] prion formation can be increased by overexpression of Sup35 since the excess Sup35 increases the probability of forming prion seeds. In contrast to oxidant-induced [PSI+] prion formation, overexpression-induced [PSI+] prion formation was only modestly affected in an abp1 mutant. Furthermore, treating yeast cells with latrunculin A to disrupt the formation of actin cables and patches abrogated oxidant-induced, but not overexpression-induced [PSI+] prion formation, suggesting a mechanistic difference in prion formation. [PIN+], the prion form of Rnq1, localizes to the IPOD (insoluble protein deposit) and is thought to influence the aggregation of other proteins. We show Sup35 becomes oxidized and aggregates during oxidative stress conditions, but does not co-localize with Rnq1 in an abp1 mutant which may account for the reduced frequency of [PSI+] prion formation. Adam, I., Jossé, L. and Tuite, M. (2017). Human TorsinA can function in the yeast cytosol as a molecular chaperone. Biochemical Journal [Online] 474:3439-3454. Available at: https://doi.org/10.1042/BCJ20170395. TorsinA (TorA) is an AAA+ ATPAse linked to dystonia type 1 (DYT1), a neurological disorder that leads to uncontrollable muscular movements. Although DYT1 is linked to a 3bp deletion in the C terminus of TorA, the biological function of TorA remains to be established. Here we use the yeast Saccharomyces cerevisiae as a tractable in vivo model to explore TorA function. We demonstrate that TorA can protect yeast cells against different forms of environmental stress and show that in the absence of the molecular disaggregase Hsp104, TorA can refold heat-denatured luciferase in vivo in an ATP-dependent manner. However, this activity requires TorA to be translocated to the cytoplasm from the ER in order to access and process cytoplasmic protein aggregates. Furthermore, mutational or chemical inactivation of the ATPase activity of TorA blocks this activity. We also find that TorA can inhibit the propagation of certain conformational variants of [ PSI +], the aggregated prion form of the endogenous Sup35 protein. Finally, we show that while cellular localisation remains unchanged in the dystonia-linked TorA mutant ?E302-303, the ability of this mutant form of TorA to protect against cellular stress and to facilitate protein refolding, is impaired, consistent with it being a loss of function mutation . Cox, B. and Tuite, M. (2017). The life of [PSI]. Current Genetics [Online]. Available at: https://dx.doi.org/10.1007/s00294-017-0714-7. The AAA+ disaggregase Hsp104 is essential for the maintenance and inheritance of nearly all known prions of the yeast Saccharomyces cerevisiae. Uniquely for [PSI+], the prion form of the Sup35 protein, there seem to be two activities, involving differing co-chaperones, by which Hsp104 affects the inheritance of [PSI+], the prion form of the Sup35 protein. Each pathway is also involved in protection against ageing, one through disaggregation of damaged proteins and the other through their retention in the mother cell during budding. Mutations in both Hsp104 and Sup35 affect prion inheritance by one or other of these pathways, as does manipulation of either Hsp104 enzyme activity or expression, in both vegetative (budding) divisions and in sporulation. Based on our recent finding (Ness et al. in Molec Microbiol 104:125–143, 2017) we suggest that the management of the heritable prion forms of Sup35 in [PSI+] cells in sporulation may be a marker for a role for Hsp104 in rejuvenation during sporulation. von der Haar, T. et al. (2017). The control of translational accuracy is a determinant of healthy ageing in yeast. Open Biology [Online] 7:160291. Available at: http://dx.doi.org/10.1098/rsob.160291. Ness, F. et al. (2017). Over-expression of the molecular chaperone Hsp104 in Saccharomyces cerevisiae results in the malpartition of [PSI + ] propagons. Molecular Microbiology [Online] 104:125-143. Available at: http://doi.org/10.1111/mmi.13617. Tuite, M. (2016). Remembering the Past: A New Form of Protein-Based Inheritance. Cell [Online] 167:302-303. Available at: http://doi.org/10.1016/j.cell.2016.09.036. Bastow, E. et al. (2016). New links between SOD1 and metabolic dysfunction from a yeast model of amyotrophic lateral sclerosis. Journal of cell science [Online] 129:4118-4129. Available at: http://dx.doi.org/10.1242/jcs.190298. A number of genes have been linked to familial forms of the fatal motor neuron disease amyotrophic lateral sclerosis (ALS). Over 150 mutations within the gene encoding superoxide dismutase 1 (SOD1) have been implicated in ALS, but why such mutations lead to ALS-associated cellular dysfunction is unclear. In this study, we identify how ALS-linked SOD1 mutations lead to changes in the cellular health of the yeast Saccharomyces cerevisiae We find that it is not the accumulation of aggregates but the loss of Sod1 protein stability that drives cellular dysfunction. The toxic effect of Sod1 instability does not correlate with a loss of mitochondrial function or increased production of reactive oxygen species, but instead prevents acidification of the vacuole, perturbs metabolic regulation and promotes senescence. Central to the toxic gain-of-function seen with the SOD1 mutants examined was an inability to regulate amino acid biosynthesis. We also report that leucine supplementation results in an improvement in motor function in a Caenorhabditis elegans model of ALS. Our data suggest that metabolic dysfunction plays an important role in Sod1-mediated toxicity in both the yeast and worm models of ALS. Tuite, M. (2015). Yeast prions: Paramutation at the protein level? Seminars in Cell & Developmental Biology [Online] 44:51-61. Available at: http://doi.org/10.1016/j.semcdb.2015.08.016. Prions are proteins that have the potential to refold into a novel conformation that templates the conversion of like molecules to the altered infectious form. In the yeast Saccharomyces cerevisiae, trans-generational epigenetic inheritance can be mediated by a number of structurally and functionally diverse prions. Prionogenesis can confer both loss-of-function and gain-of-function properties to the prion protein and this in turn can have a major impact on host phenotype, short-term adaptation and evolution of new traits. Prionogenesis shares a number of properties in common with paramutation and can be considered as a mitotically and meiotically heritable change in protein conformation induced by trans-interactions between homologous proteins. Doronina, V. et al. (2015). Oxidative stress conditions increase the frequency ofde novoformation of the yeast [PSI+] prion. Molecular Microbiology [Online] 96:163-174. Available at: http://dx.doi.org/10.1111/mmi.12930. Prions are self-perpetuating amyloid protein aggregates which underlie various neurodegenerative diseases in mammals and heritable traits in yeast. The molecular basis of how yeast and mammalian prions form spontaneously into infectious amyloid-like structures is poorly understood. We have explored the hypothesis that oxidative stress is a general trigger for prion formation using the yeast [PSI+] prion, which is the altered conformation of the Sup35 translation termination factor. We show that the frequency of [PSI+] prion formation is elevated under conditions of oxidative stress and in mutants lacking key antioxidants. We detect increased oxidation of Sup35 methionine residues in antioxidant mutants and show that overexpression of methionine sulphoxide reductase abrogates both the oxidation of Sup35 and its conversion to the [PSI+] prion. [PSI+] prion formation is particularly elevated in a mutant lacking the Sod1 Cu,Zn-superoxide dismutase. We have used fluorescence microscopy to show that the de novo appearance of [PSI+] is both rapid and increased in frequency in this mutant. Finally, electron microscopy analysis of native Sup35 reveals that similar fibrillar structures are formed in both the wild-type and antioxidant mutants. Together, our data indicate that oxidative stress is a general trigger of [PSI+] formation, which can be alleviated by antioxidant defenses. Tuite, M., Staniforth, G. and Cox, B. (2015). [PSI+] turns 50. Prion [Online] 9:318-332. Available at: http://doi.org/10.1080/19336896.2015.1111508. The year 2015 sees the fiftieth anniversary of the publication of a research paper that underpins much of our understanding of fungal prion biology, namely “?, a cytoplasmic suppressor of super-suppressor in yeast” by Brian Cox. Here we show how our understanding of the molecular nature of the [PSI+] determinant evolved from an ‘occult’ determinant to a transmissible amyloid form of a translation termination factor. We also consider the impact studies on [PSI] have had – and continue to have - on prion research. To demonstrate this, leading investigators in the yeast prion field who have made extensive use of the [PSI+] trait in their research, provide their own commentaries on the discovery and significance of [PSI]. Staniforth, G. and Tuite, M. (2014). Monoculture Breeds Poor Social Skills. Cell [Online] 158:975-977. Available at: http://dx.doi.org/10.1016/j.cell.2014.08.004. Tuite, M., Howard, M. and Xue, W. (2014). Dynamic Prions Revealed by Magic. Chemistry & Biology [Online] 21:172-173. Available at: http://dx.doi.org/10.1016/j.chembiol.2014.02.001. Prion proteins can be propagated as amyloid fibrils with several different conformational variants. By providing structural information at atomic level for two such variants of a yeast prion, Frederick and colleagues, in this issue of Chemistry & Biology, reveal how conformational flexibility can generate pheno- typic diversity. Chu, D. et al. (2014). Translation elongation can control translation initiation on eukaryotic mRNAs. EMBO Journal [Online] 33:21-34. Available at: http://dx.doi.org/10.1002/embj.201385651. Synonymous codons encode the same amino acid, but differ in other biophysical properties. The evolutionary selection of codons whose properties are optimal for a cell generates the phenomenon of codon bias. Although recent studies have shown strong effects of codon usage changes on protein expression levels and cellular physiology, no translational control mechanism is known that links codon usage to protein expression levels. Here, we demonstrate a novel translational control mechanism that responds to the speed of ribosome movement immediately after the start codon. High initiation rates are only possible if start codons are liberated sufficiently fast, thus accounting for the observation that fast codons are overrepresented in highly expressed proteins. In contrast, slow codons lead to slow liberation of the start codon by initiating ribosomes, thereby interfering with efficient translation initiation. Codon usage thus evolved as a means to optimise translation on individual mRNAs, as well as global optimisation of ribosome availability. Mead, E. et al. (2014). Control and regulation of mRNA translation. Biochemical Society transactions [Online] 42:151-154. Available at: http://dx.doi.org/10.1042/BST20130259. Translational control is central to the gene expression pathway and was the focus of the 2013 annual Translation UK meeting held at the University of Kent. The meeting brought together scientists at all career stages to present and discuss research in the mRNA translation field, with an emphasis on the presentations on the research of early career scientists. The diverse nature of this field was represented by the broad range of papers presented at the meeting. The complexity of mRNA translation and its control is emphasized by the interdisciplinary research approaches required to address this area with speakers highlighting emerging systems biology techniques and their application to understanding mRNA translation and the network of pathways controlling it. Marchante, R. et al. (2013). Structural Definition Is Important for the Propagation of the Yeast [PSI+] Prion. Molecular Cell [Online] 50:675-685. Available at: http://dx.doi.org/10.1016/j.molcel.2013.05.010. Preiss, T. et al. (2013). Specialized Yeast Ribosomes: A Customized Tool for Selective mRNA Translation. PLoS ONE [Online] 8:e67609. Available at: http://dx.doi.org/10.1371/journal.pone.0067609. Evidence is now accumulating that sub-populations of ribosomes - so-called specialized ribosomes - can favour the translation of subsets of mRNAs. Here we use a large collection of diploid yeast strains, each deficient in one or other copy of the set of ribosomal protein (RP) genes, to generate eukaryotic cells carrying distinct populations of altered ‘specialized’ ribosomes. We show by comparative protein synthesis assays that different heterologous mRNA reporters based on luciferase are preferentially translated by distinct populations of specialized ribosomes. These mRNAs include reporters carrying premature termination codons (PTC) thus allowing us to identify specialized ribosomes that alter the efficiency of translation termination leading to enhanced synthesis of the wild-type protein. This finding suggests that these strains can be used to identify novel therapeutic targets in the ribosome. To explore this further we examined the translation of the mRNA encoding the extracellular matrix protein laminin ?3 (LAMB3) since a LAMB3-PTC mutant is implicated in the blistering skin disease Epidermolysis bullosa (EB). This screen identified specialized ribosomes with reduced levels of RP L35B as showing enhanced synthesis of full-length LAMB3 in cells expressing the LAMB3-PTC mutant. Importantly, the RP L35B sub-population of specialized ribosomes leave both translation of a reporter luciferase carrying a different PTC and bulk mRNA translation largely unaltered. Jossé, L. et al. (2012). Probing the role of structural features of mouse PrP in yeast by expression as Sup35-PrP fusions. Prion [Online] 6:201-210. Available at: http://dx.doi.org/10.4161/pri.19214. The yeast Saccharomyces cerevisiae is a tractable model organism in which both to explore the molecular mechanisms underlying the generation of disease-associated protein misfolding and to map the cellular responses to potentially toxic misfolded proteins. Specific targets have included proteins which in certain disease states form amyloids and lead to neurodegeneration. Such studies are greatly facilitated by the extensive ‘toolbox’ available to the yeast researcher that provides a range of cell engineering options. Consequently, a number of assays at the cell and molecular level have been set up to report on specific protein misfolding events associated with endogenous or heterologous proteins. One major target is the mammalian prion protein PrP because we know little about what specific sequence and/or structural feature(s) of PrP are important for its conversion to the infectious prion form, PrPSc. Here, using a study of the expression in yeast of fusion proteins comprising the yeast prion protein Sup35 fused to various regions of mouse PrP protein, we show how PrP sequences can direct the formation of non-transmissible amyloids and focus in particular on the role of the mouse octarepeat region. Through this study we illustrate the benefits and limitations of yeast-based models for protein misfolding disorders. Tuite, M., Marchante, R. and Kushnirov, V. (2011). Fungal Prions: Structure, Function and Propagation. Topics in Current Chemistry [Online] 305:257-298. Available at: http://dx.doi.org/10.1007/128_2011_172. Prions are not uniquely associated with rare fatal neurodegenerative diseases in the animal kingdom; prions are also found in fungi and in particular the yeast Saccharomyces cerevisiae. As with animal prions, fungal prions are proteins able to exist in one or more self-propagating alternative conformations, but show little primary sequence relationship with the mammalian prion protein PrP. Rather, fungal prions represent a relatively diverse collection of proteins that participate in key cellular processes such as transcription and translation. Upon switching to their prion form, these proteins can generate stable, sometimes beneficial, changes in the host cell phenotype. Much has already been learnt about prion structure, and propagation and de novo generation of the prion state through studies in yeast and these findings are reviewed here. Afanasieva, E. et al. (2011). Molecular Basis for Transmission Barrier and Interference between Closely Related Prion Proteins in Yeast. Journal of Biological Chemistry [Online] 286:15773-15780. Available at: http://dx.doi.org/10.1074/jbc.M110.183889. Replicating amyloids, called prions, are responsible for transmissible neurodegenerative diseases in mammals and some heritable phenotypes in fungi. The transmission of prions between species is usually inhibited, being highly sensitive to small differences in amino acid sequence of the prion-forming proteins. To understand the molecular basis of this prion interspecies barrier, we studied the transmission of the [PSI+] prion state from Sup35 of Saccharomyces cerevisiae to hybrid Sup35 proteins with prion-forming domains from four other closely related Saccharomyces species. Whereas all the hybrid Sup35 proteins could adopt a prion form in S. cerevisiae, they could not readily acquire the prion form from the [PSI+] prion of S. cerevisiae. Expression of the hybrid Sup35 proteins in S. cerevisiae [PSI+] cells often resulted in frequent loss of the native [PSI+] prion. Furthermore, all hybrid Sup35 proteins showed different patterns of interaction with the native [PSI+] prion in terms of co-polymerization, acquisition of the prion state, and induced prion loss, all of which were also dependent on the [PSI+] variant. The observed loss of S. cerevisiae [PSI+] can be related to inhibition of prion polymerization of S. cerevisiae Sup35 and formation of a non-heritable form of amyloid. We have therefore identified two distinct molecular origins of prion transmission barriers between closely sequence-related prion proteins: first, the inability of heterologous proteins to co-aggregate with host prion polymers, and second, acquisition by these proteins of a non-heritable amyloid fold. Sideri, T. et al. (2011). Methionine Oxidation of Sup35 Protein Induces Formation of the [PSI+] Prion in a Yeast Peroxiredoxin Mutant. Journal of Biological Chemistry [Online] 286:38924-38931. Available at: http://dx.doi.org/10.1074/jbc.M111.272419. The frequency with which the yeast [PSI+] prion form of Sup35 arises de novo is controlled by a number of genetic and environmental factors. We have previously shown that in cells lacking the antioxidant peroxiredoxin proteins Tsa1 and Tsa2, the frequency of de novo formation of [PSI+] is greatly elevated. We show here that Tsa1/Tsa2 also function to suppress the formation of the [PIN+] prion form of Rnq1. However, although oxidative stress increases the de novo formation of both [PIN+] and [PSI+], it does not overcome the requirement of cells being [PIN+] to form the [PSI+] prion. We use an anti-methionine sulfoxide antibody to show that methionine oxidation is elevated in Sup35 during oxidative stress conditions. Abrogating Sup35 methionine oxidation by overexpressing methionine sulfoxide reductase (MSRA) prevents [PSI+] formation, indicating that Sup35 oxidation may underlie the switch from a soluble to an aggregated form of Sup35. In contrast, we were unable to detect methionine oxidation of Rnq1, and MSRA overexpression did not affect [PIN+] formation in a tsa1 tsa2 mutant. The molecular basis of how yeast and mammalian prions form infectious amyloid-like structures de novo is poorly understood. Our data suggest a causal link between Sup35 protein oxidation and de novo [PSI+] prion formation. Tuite, M. and Serio, T. (2010). The prion hypothesis: from biological anomaly to basic regulatory mechanism. Nature Reviews Molecular Cell Biology [Online] 11:823-833. Available at: http://dx.doi.org/10.1038/nrm3007. Prions are unusual proteinaceous infectious agents that are typically associated with a class of fatal degenerative diseases of the mammalian brain. However, the discovery of fungal prions, which are not associated with disease, suggests that we must now consider the effect of these factors on basic cellular physiology in a different light. Fungal prions are epigenetic determinants that can alter a range of cellular processes, including metabolism and gene expression pathways, and these changes can lead to a range of prion-associated phenotypes. The mechanistic similarities between prion propagation in mammals and fungi suggest that prions are not a biological anomaly but instead could be a newly appreciated and perhaps ubiquitous regulatory mechanism. Sideri, T. et al. (2010). Ribosome-associated peroxiredoxins suppress oxidative stress-induced de novo formation of the [PSI+] prion in yeast. Proceedings of the National Academy of Sciences [Online] 107:6394-6399. Available at: http://dx.doi.org/10.1073/pnas.1000347107. Peroxiredoxins (Prxs) are ubiquitous antioxidants that protect cells against oxidative stress. We show that the yeast Tsa1/Tsa2 Prxs colocalize to ribosomes and function to protect the Sup35 translation termination factor against oxidative stress–induced formation of its heritable [PSI+] prion conformation. In a tsa1 tsa2 [psi-] [PIN+] strain, the frequency of [PSI+] de novo formation is significantly elevated. The Tsa1/Tsa2 Prxs, like other 2-Cys Prxs, have dual activities as peroxidases and chaperones, and we show that the peroxidase activity is required to suppress spontaneous de novo [PSI+] prion formation. Molecular oxygen is required for [PSI+] prion formation as growth under anaerobic conditions prevents prion formation in the tsa1 tsa2 mutant. Conversely, oxidative stress conditions induced by exposure to hydrogen peroxide elevates the rate of de novo [PSI+] prion formation leading to increased suppression of all three termination codons in the tsa1 tsa2 mutant. Altered translational fidelity in [PSI+] strains may provide a mechanism that promotes genetic variation and phenotypic diversity (True HL, Lindquist SL (2000) Nature 407:477–483). In agreement, we find that prion formation provides yeast cells with an adaptive advantage under oxidative stress conditions, as elimination of the [PSI+] prion from tsa1 tsa2 mutants renders the resulting [psi-] [pin-] cells hypersensitive to hydrogen peroxide. These data support a model in which Prxs function to protect the ribosomal machinery against oxidative damage, but when these systems become overwhelmed, [PSI+] prion formation provides a mechanism for uncovering genetic traits that aid survival during oxidative stress conditions. Moosavi, B., Wongwigkarn, J. and Tuite, M. (2010). Hsp70/Hsp90 co-chaperones are required for efficient Hsp104-mediated elimination of the yeast [PSI+] prion but not for prion propagation. Yeast [Online] 27:167-179. Available at: http://dx.doi.org/10.1002/yea.1742. he continued propagation of the yeast [PSI+] prion requires the molecular chaperone Hsp104 yet in cells engineered to overexpress Hsp104; prion propagation is impaired leading to the rapid appearance of prion-free [psi?] cells. The underlying mechanism of prion loss in such cells is unknown but is assumed to be due to the complete dissolution of the prion aggregates by the ATP-dependent disaggregase activity of this chaperone. To further explore the mechanism, we have sought to identify cellular factors required for prion loss in such cells. Sti1p and Cpr7p are co-chaperones that modulate the activity of Hsp70/Ssa and Hsp90 chaperones and bind to the C-terminus of Hsp104. Neither Sti1p nor Cpr7p is necessary for prion propagation but we show that deletion of the STI1 and CPR7 genes leads to a significant reduction in the generation of [psi?] cells by Hsp104 overexpression. Deletion of the STI1 and CPR7 genes does not modify the elimination of [PSI+] by guanidine hydrochloride, which inhibits the ATPase activity of Hsp104 but does block elimination of [PSI+] by overexpression of either an ATPase-defective mutant of Hsp104 (hsp104K218T/K620T) or a ‘trap’ mutant Hsp104 (hsp104E285Q/E687Q) that can bind its substrate but can not release it. These results provide support for the hypothesis that [PSI+] elimination by Hsp104 overexpression is not simply a consequence of complete dissolution of the prion aggregates but rather is through a mechanism distinct from the remodelling activity of Hsp104. Jossé, L., Smales, C. and Tuite, M. (2010). Transient expression of human TorsinA enhances secretion of two functionally distinct proteins in cultured Chinese hamster ovary (CHO) cells. Biotechnology and Bioengineering [Online] 105:556-566. Available at: http://dx.doi.org/10.1002/bit.22572. Cultured mammalian cells, particularly Chinese hamster ovary (CHO) cells, are widely exploited as hosts for the production of recombinant proteins, but often yields are limiting. Such limitations may be due in part to the misfolding and subsequent degradation of the heterologous proteins. Consequently we have determined whether transiently co-expressing yeast and/or mammalian chaperones that act to disaggregate proteins, in CHO cell lines, improve the levels of either a cytoplasmic (Fluc) or secreted (Gluc) form of luciferase or an immunoglobulin IgG4 molecule. Over-expression of the yeast ‘protein disaggregase’ Hsp104 in a CHO cell line increased the levels of Fluc more significantly than for Gluc although levels were not further elevated by over-expression of the yeast or mammalian Hsp70/40 chaperones. Over-expression of TorsinA, a mammalian protein related in sequence to yeast Hsp104, but located in the ER, significantly increased the level of secreted Gluc from CHO cells by 2.5-fold and to a lesser extent the secreted levels of a recombinant IgG4 molecule. These observations indicate that the over-expression of yeast Hsp104 in mammalian cells can improve recombinant protein yield and that over-expression of TorsinA in the ER can promote secretion of heterologous proteins from mammalian cells. Merritt, G. et al. (2010). Decoding accuracy in eRF1 mutants and its correlation with pleiotropic quantitative traits in yeast. Nucleic acids research [Online] 38:5479-5492. Available at: http://dx.doi.org/10.1093/nar/gkq338. Translation termination in eukaryotes typically requires the decoding of one of three stop codons UAA, UAG or UGA by the eukaryotic release factor eRF1. The molecular mechanisms that allow eRF1 to decode either A or G in the second nucleotide, but to exclude UGG as a stop codon, are currently not well understood. Several models of stop codon recognition have been developed on the basis of evidence from mutagenesis studies, as well as studies on the evolutionary sequence conservation of eRF1. We show here that point mutants of Saccharomyces cerevisiae eRF1 display significant variability in their stop codon read-through phenotypes depending on the background genotype of the strain used, and that evolutionary conservation of amino acids in eRF1 is only a poor indicator of the functional importance of individual residues in translation termination. We further show that many phenotypes associated with eRF1 mutants are quantitatively unlinked with translation termination defects, suggesting that the evolutionary history of eRF1 was shaped by a complex set of molecular functions in addition to translation termination. We reassess current models of stop-codon recognition by eRF1 in the light of these new data. Yeast (Saccharomyces cerevisiae) prions are efficiently propagated and the on-going generation and transmission of prion seeds (propagons) to daughter cells during cell division ensures a high degree of mitotic stability. The reversible inhibition of the molecular chaperone Hsp104p by guanidine hydrochloride (GdnHCl) results in cell division-dependent elimination of yeast prions due to a block in propagon generation and the subsequent dilution out of propagons by cell division. Analysing the kinetics of the GdnHCl-induced elimination of the yeast [PSI+] prion has allowed us to develop novel statistical models that aid our understanding of prion propagation in yeast cells. Here we describe the application of a new stochastic model that allows us to estimate more accurately the mean number of propagons in a [PSI+] cell. To achieve this accuracy we also experimentally determine key cell reproduction parameters and show that the presence of the [PSI+] prion has no impact on these key processes. Additionally, we experimentally determine the proportion of propagons transmitted to a daughter cell and show this reflects the relative cell volume of mother and daughter cells at cell division. While propagon generation is an ATP-driven process, the partition of propagons to daughter cells occurs by passive transfer via the distribution of cytoplasm. Furthermore, our new estimates of n0, the number of propagons per cell (500–1000), are some five times higher than our previous estimates and this has important implications for our understanding of the inheritance of the [PSI+] and the spontaneous formation of prion-free cells. Studte, P. et al. (2008). tRNA and protein methylase complexes mediate zymocin toxicity in yeast. Molecular Microbiology [Online] 69:1266-1277. Available at: http://dx.doi.org/10.1111/j.1365-2958.2008.06358.x. Tuite, M. et al. (2008). Cellular factors important for the de novo formation of yeast prions. Biochemical Society Transactions [Online] 36:1083-1087. Available at: http://dx.doi.org/10.1042/bst0361083. Prions represent an unusual structural form of a protein that is 'infectious'. in mammals, prions are associated with fatal neurodegenerative diseases such as CJD (Creutzfeldt-jakob disease), while in fungi they act as novel epigenetic regulators of phenotype. Even though most of the human prion diseases arise spontaneously, we still know remarkably little about how infectious prions form de novo. The [PSI+] prion of the yeast Saccharomyces cerevisiae provides a highly tractable model in which to explore the underlying mechanism of de novo prion formation, in particular identifying key cis- and trans-acting factors. Most significantly, the de novo formation of [PSI+] requires the presence of a second prion called [PIN+], which is typically the prion form of Rnq1p, a protein rich in glutamine and aspartic acid residues. The molecular mechanism by which the [PIN+] prion facilitates de novo [PSI+] formation is not fully established, but most probably involves some form of cross-seeding. A number of other cellular factors, in particular chaperones of the Hsp70 (heat-shock protein 70) family, are known to modify the frequency of de novo prion formation in yeast. von der Haar, T. and Tuite, M. (2007). Regulated translational bypass of stop codons in yeast. Trends in Microbiology [Online] 15:78-86. Available at: http://www.sciencedirect.com/science?_ob=ArticleURL&_udi=B6TD0-4MMFVM7-1&_user=125871&_rdoc=1&_fmt=&_orig=search&_sort=d&view=c&_acct=C000010239&_version=1&_urlVersion=0&_userid=125871&md5=8405943db881e3df6b0707ef075a9c1e. von der Haar, T. et al. (2007). Development of a novel yeast cell-based system for studying the aggregation of Alzheimer's disease-associated A beta peptides in vivo. Neurodegenerative Diseases [Online] 4:136-147. Available at: http://dx.doi.org/10.1159/000101838. Alzheimer's disease is the most common neurodegenerative disease, affecting -50% of humans by age 85. The disease process is associated with aggregation of the AP peptides, short 39-43 residue peptides generated through endoproteolytic cleavage of the Alzheimer's precursor protein. While the process of aggregation of purified AP peptides in vitro is beginning to be well understood, little is known about this process in vivo. In the present study, we use the yeast Saccharomyces cerevisiae as a model system for studying A beta-mediated aggregation in an organism in vivo. One of this yeast's endogenous prions, Sup35/[PSI+] loses the ability to aggregate when the prion-forming domain of this protein is deleted. We show that insertion of AP pepticle sequences in place of the original prion domain of this protein restores its ability to aggregate. However, the aggregates are qualitatively different from [PSI+] prions in their sensitivity to detergents and in their requirements on transacting factors that are normally needed for [PSI+] propagation. We conclude that we have established a useful new tool for studying the aggregation of AP peptides in an organism in vivo. Alderton, A. et al. (2006). Zeocin resistance as a dominant selective marker for transformation and targeted gene deletions in Candida glabrata. Mycoses [Online] 49:445-451. Available at: http://dx.doi.org/10.1111/j.1439-0507.2006.01271.x. Many of the genetic tools used to generate gene knockouts in Candida glabrata exploit auxotrophic markers but this is not suitable for use with clinical strains. Antibiotic resistance markers, however, allow one to target genes to be deleted without any prior genetic manipulation of clinical isolates. Such antibiotic selection markers have been widely reported for the manipulation of Saccharomyces cerevisiae. However, very few antibiotic resistance markers have been shown to be useful in C. glabrata. Here, we report the use of Zeocin resistance (ZeoR), encoded by the ble gene from Streptoalloteichus hindustanus, as a new positive selection marker for the genetic manipulation of C. glabrata including clinical strains that we show are significantly more sensitive to Zeocin than to G418. The potential of the ZeoR marker for targeted gene disruption in C. glabrata was confirmed by constructing deletions of the ADE2 in both a laboratory and a clinical strain of C. glabrata, using both short (90 bp) and long (400 bp) homology cassettes. new approximations are shown to have high efficiency. Shkundina, I. et al. (2006). The role of the N-terminal oligopeptide repeats of the yeast Sup35 prion protein in propagation and transmission of prion variants. Genetics [Online] 172:827-835. Available at: http://dx.doi.org/10.1534/genetics.105.048660. The cytoplasmic [PSI+] determinant of Saccharomyces cerevisiae is the prion form of the Sup35 protein. Oligopeptide repeats within the Sup35 N-terminal domain (PrD) presumably are required for the stable [PSI+] inheritance that in turn involves fragmentation of Sup35 polymers by the chaperone Hsp104. The nonsense suppressor [PSI+] phenotype can vary in efficiency probably due to different inheritable Sup35 polymer structures. Here we study the ability of Sup35 mutants with various deletions of the oligopeptide repeats to support [PSI+] propagation. We define the minimal region of the Sup35-PrD necessary to support [PSI+] as amino acids 1-64, which include the first two repeats, although a longer fragment, 1-83, is required to maintain weak [PSI+] variants. Replacement of wild-type Sup35 with deletion mutants decreases the strength of the [PSI+] phenotype. However, with one exception, reintroducing the wild-type Sup35 restores the original phenotype. Thus, the specific prion fold defining the [PSI+] variant can be preserved by the mutant Sup35 protein despite the change of phenotype. Coexpression of wild-type and mutant Sup35 containing three, two, one, or no oligopeptide repeats causes variant-specific [PSI+] elimination. These data suggest that [PSI+] variability is primarily defined by differential folding of the Sup35-PrD oligopeptide-repeat region. Tuite, M. and Cox, B. (2006). The [PSI+] prion of yeast: a problem of inheritance. Methods [Online] 39:9-22. Available at: http://dx.doi.org/10.1016/j.ymeth.2006.04.001. The [PSI(+)] prion of the yeast Saccharomyces cerevisiae was first identified by Brian Cox some 40 years ago as a non-Mendelian genetic element that modulated the efficiency of nonsense suppression. Following the suggestion by Reed Wickner in 1994 that such elements might be accounted for by invoking a prion-based model, it was subsequently established that the [PSI(+)] determinant was the prion form of the Sup35p protein. In this article, we review how a combination of classical genetic approaches and modern molecular and biochemical methods has provided conclusive evidence of the prion basis of the [PSI(+)] determinant. In so doing we have tried to provide a historical context, but also describe the results of more recent experiments aimed at elucidating the mechanism by which the [PSI(+)] (and other yeast prions) are efficiently propagated in dividing cells. While understanding of the [PSI(+)] prion and its mode of propagation has, and will continue to have, an impact on mammalian prion biology nevertheless the very existence of a protein-based mechanism that can have a beneficial impact on a cell's fitness provides equally sound justification to fully explore yeast prions. Zenthon, J. et al. (2006). The [PSI+] prion of Saccharomyces cerevisiae can be propagated by an Hsp104 orthologue from Candida albicans. Eukaryotic Cell [Online] 5:217-225. Available at: http://dx.doi.org/10.1128/EC.5.2.217-225.2006. The molecular chaperone Hsp104 is not only a key component of the cellular machinery induced to disassemble aggregated proteins in stressed cells of Saccharomyces cerevisiae but also plays an essential role in the propagation of the [PSI+], [URE3], and [RNQ/PIN+] prions in this organism. Here we demonstrate that the fungal pathogen Candida albicans carries an 899-residue stress-inducible orthologue of Hsp104 (CaHsp104) that shows a high degree of amino acid identity to S. cerevisiae Hsp104 (ScHsp104). This identity is significantly lower in the N- and C-terminal regions implicated in substrate recognition and cofactor binding, respectively. CaHsp104 is able to provide all known functions of ScHsp104 in an S. cerevisiae hsp104 null mutant, i.e., tolerance to high-temperature stress, reactivation of heat-denatured proteins, and propagation of the [PSI+] prion. As also observed for ScHsp104, overexpression of CaHsp104 leads to a loss of the [PSI+] prion. However, unlike that of ScHsp104, CaHsp104 function is resistant to guanidine hydrochloride (GdnHCl), an inhibitor of the ATPase activity of this chaperone. These findings have implications both in terms of the mechanism of inhibition of Hsp104 by GdnHCl and in the evolution of the ability of fungal species to propagate prions. Tuite, M. and von der Haar, T. (2016). Transfer RNA in Decoding and the Wobble Hypothesis. in: eLS. Wiley, pp. 1-7. Available at: http://doi.org/10.1002/9780470015902.a0001497.pub2. Translation of the genetic code stored in messenger ribonucleic acid (RNA) requires significantly fewer transfer RNAs (35–45) than there are codons (61, amino acid specifying). This is achieved through an increased flexibility in the allowable base-pair interactions between the messenger RNA and the transfer RNA involving the third position of the codon and the first position of the corresponding anticodon. The rules governing this RNA:RNA interaction were originally summarised in Crick's ‘wobble hypothesis’. Covalent modification of the first base of an anticodon of a transfer RNA can profoundly affect the degree of flexibility in its base-pairing potential by either extending or restricting such interactions. Recent studies suggest that the rate at which a codon is processed by the ribosome is influenced by whether or not decoding of that codon is via wobble base interactions. Yet, in spite of this flexibility and different rates of processing, decoding by transfer RNAs is achieved with considerable accuracy. Tuite, M. (2013). The Natural History of Yeast Prions. in: Sariaslani, S. and Gadd, G. M. eds. Advances in Applied Microbiology. Elsevier Inc., pp. 85-137. Available at: http://dx.doi.org/10.1016/B978-0-12-407673-0.00003-5. Although prions were first discovered through their link to severe brain degenerative diseases in animals, the emergence of prions as regulators of the phenotype of the yeast Saccharomyces cerevisiae and the filamentous fungus Podospora anserina has revealed a new facet of prion biology. In most cases, fungal prions are carried without apparent detriment to the host cell, representing a novel form of epigenetic inheritance. This raises the question of whether or not yeast prions are beneficial survival factors or actually gives rise to a “disease state” that is selected against in nature. To date, most studies on the impact of fungal prions have focused on laboratory-cultivated “domesticated” strains of S. cerevisiae. At least eight prions have now been described in this species, each with the potential to impact on a wide range of cellular processes. The discovery of prions in nondomesticated strains of S. cerevisiae and P. anserina has confirmed that prions are not simply an artifact of “domestication” of this species. In this review, I describe what we currently know about the phenotypic impact of fungal prions. I then describe how the interplay between host genotype and the prion-mediated changes can generate a wide array of phenotypic diversity. How such prion-generated diversity may be of benefit to the host in survival in a fluctuating, often hazardous environment is then outlined. Prion research has now entered a new phase in which we must now consider their biological function and evolutionary significance in the natural world. Jossé, L., Smales, C. and Tuite, M. (2012). Engineering the Chaperone Network of CHO Cells for Optimal Recombinant Protein Production and Authenticity. in: Recombinant Gene Expression. Springer New York, pp. 595-608. Available at: http://dx.doi.org/10.1007/978-1-61779-433-9_32. All proteins fold into a defined three-dimensional shape that is compatible with the cellular role and/or biological activity of those proteins. Molecular chaperones are a family of proteins whose role is to assist the folding and targeting of proteins in both normal and stressed cells. The rational manipulation of chaperone levels in a cell line engineered to produce a defined recombinant protein (rP) can significantly improve both the achievable steady-state levels and authenticity of a wide range of recombinant proteins. Here, we describe the methodology associated with expressing a variety of molecular chaperones in Chinese hamster ovary (CHO) lines in order to improve their recombinant protein production capacity. These chaperones include both those that facilitate the folding of the polypeptide chain (i.e. Hsp70, Hsp40) and those that can re-fold proteins that have misfolded in the cell (i.e. ClpB/Hsp104). This latter property is particularly important given the propensity for highly expressed recombinant proteins to misfold in the “foreign” cellular environment. Cox, B., Byrne, L. and Tuite, M. (2007). Prion stability. in: Chernoff, Y. O. ed. Protein-based inheritance. Landes Biosciences, pp. 56-72. Tuite, M. and Cox, B. (2007). The genetic control of the formation and propagation of the [PSI+] prion. in: Chernoff, Y. O. ed. Protein-based inheritance. Landes Biosciences, pp. 14-29. Tuite, M. et al. (2007). Yeast prions and their analysis in vivo. in: Yeast gene analysis, second edition. San Diego, US: Elsevier Academic Press, pp. 491-526. Tuite, M. (2016). Molecular communication: An acid tale of prion formation. eLife [Online] 5. Available at: http://dx.doi.org/10.7554/eLife.22256. Tuite, M. and Melki, R. (2007). Protein misfolding and aggregation in ageing and disease: molecular processes and therapeutic perspectives. Prion 1:116-120. Tuite, M. and Cox, B. (2007). The genetic control of the formation and propagation of the [PSI+] prion. Prion 1:101-109. Beal, D. et al. (2019). Quantitative Analyses of the Yeast Oxidative Protein Folding Pathway in Vitro and in Vivo. Antioxidants & Redox Signalling [Online]. Available at: http://dx.doi.org/10.1089/ars.2018.7615. Aims: Efficient oxidative protein folding (OPF) in the endoplasmic reticulum (ER) is a key requirement of the eukaryotic secretory pathway. In particular, protein folding linked to the formation of disulfide bonds, an activity dependent on the enzyme protein disulfide isomerase (PDI), is crucial. For the de novo formation of disulphide bonds, reduced PDI must be re-oxidised by an ER-located oxidase (ERO1). Despite some knowledge of this pathway, the kinetic parameters with which these components act and the importance of specific parameters, such as PDI reoxidation by Ero1, for the overall performance of OPF in vivo remain poorly understood. Results: We established an in vitro system using purified yeast (Saccharomyces cerevisiae) PDI (Pdi1p) and ERO1 (Ero1p) to investigate OPF. This necessitated the development of a novel reduction/oxidation processing strategy to generate homogenously oxidised recombinant yeast Ero1p. This new methodology enabled the quantitative assessment of the interaction of Pdi1p and Ero1p in vitro by measuring oxygen consumption and reoxidation of reduced RNAase A. The resulting quantitative data were then used to generate a simple model which can describe the oxidising capacity of Pdi1p and Ero1p in vitro and predict the in vivo effect of modulation of the levels of these proteins. Innovation: We describe a model that can be used to explore the OPF pathway and its control in a quantitative way. Conclusion: Our study provides new insights into how OPF works at a molecular level and provides a platform for the design of more efficient heterologous protein expression systems in yeast.